The government is considering making big changes to the way the railways are run. Jon Yuill, the Magazine's rail commuter champion, reports on how one early bit of reorganisation has worked. All the different services going in to Liverpool Street have been rationalised under one company, part of the government's efforts to make the railways a more efficient organisation. The name of the new company is one. That's it - one. Not One, but one. Very fashionable I'm sure, but a name which has caused many a puzzled look on the platform, as in "Was that announcement 'the 7.31 train', or 'the 7.30 one train'?" Subtle punctuation, like needlessly trendy branding, does not translate well to crackly platform public address systems. To avoid confusion, henceforth in this column I shall use the word "one" as God intended, and when referring to the train operator I shall represent it as «one», both for clarity and dramatic effect. Last week was a bad one on our line, from Clacton to Liverpool Street. Almost every day there were delays, some of them long. More annoyingly, it seems that «one» doesn't seem to have told its drivers that not informing passengers about the cause of delays leads to frustration and anger. 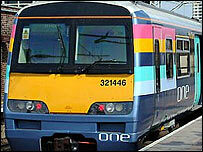 It can also end in a platform punch-up, such as the one witnessed at Witham. Actually, one or two of the drivers did offer up some excuses, but "This train is delayed because it's delayed" isn't actually a reason. We also had the modern classic "Delayed because of a delay on its previous journey". It's also been a bad week for smells. The Curse of Platform 12 (one of my Yuill Log hobby horses) been eradicated, I'm glad to say. But a fresh assault on my nostrils was launched by several fellow commuters who, while having the latest hand-held gadgetry, seem to have forgotten how to use a bar of soap. Take Thursday's journey home for example. 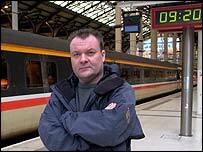 In the style of a budget airline, the already delayed train was turned around quickly to make up for lost time. Thus, no cleaner came aboard. Which is how I nearly came to sit on a half eaten cod and chips left on the seat. Had I known how long the journey was going to take, I would have eaten it. It seems "Revenue Protectors" can be placed on moving trains, but not cleaners. At Stratford I was left gagging by the high-powered BO of a smartly dressed business type who wedged himself in the middle seat. The stench was appalling, but moving was out of the question as the train was already packed. On one occasion, luckily, the delay was on a Desiro model, which have noisy but efficient air-con. So far, they seem to have coped well in the hot weather, so although you may be delayed, at least you're not sitting in something resembling a Turkish wrestler's jock strap. With no windows to open, I dread the day the air-con packs in. When «one» took over the running from First Great Eastern, who had in turn taken over from someone else, it was much heralded. But us jaded and cynical lot need more than a new logo, I'm afraid. I realise «one» can't be held responsible for the slovenliness of commuters, but at least they could have brought some new excuses to the party. They might start with spelling the county town of Suffolk correctly. In their latest timetable, it's spelt Ipwich throughout. Which brings me back to the reorganisation of the railways, which has been uncovered by an enterprising BBC transport correspondent. The government is, it seems, planning to do away with the Strategic Rail Authority because - get this - it thinks there's "no coherent strategy"! I doubt my fellow commuters will shed many tears for the SRA - not least because we're beginning to get used to a state of permanent revolution. So my one plea to the government in my role as an everyman voice from the platform is... whatever you do, please don't make things any worse. Train operator 'one' acknowledged that train service performance on their Metro and Mainline services to and from Liverpool Street had been "disappointing" in the week commencing 7 June. A spokesman said: "Problems caused by infrastructure failures related to the extreme hot weather in the early part of the week was one of the main causes of concern." He said that in the first two months of the new franchise, performance had been at "very encouraging levels", with 90.8% of trains arriving on time in May. "Despite last week's difficulties, will continue to focus on initiatives to deliver punctuality and reliability improvements and to raise service quality standards across the region," he said.